Neurons actively shuttle membranous cargos called “organelles” along microtubule tracks using motor proteins that are essentially molecular engines. The motor proteins literally walk along the tracks, shouldering their cargos. Research published in two back-to-back papers in the September issue of GENETICS reveals a neuron-specific transmission system for regulating one of the motors. The microtubule tracks are directionally oriented, with their “plus ends” pointing away from the cell soma and their “minus ends” pointing toward the cell soma. 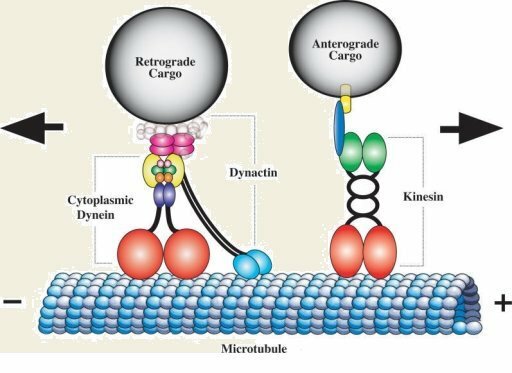 Neurons have several kinds of motors that move cargos outward in the plus-end direction, but only one motor, known as dynein, that can move cargos back to the cell soma (known as “retrograde” transport; see above image). Neurons have a very unique architecture, with a single long axon that, in humans, can extend as far as one meter from the cell body (“cell soma”) of the neuron. The axon contains what is perhaps the quintessential feature of neurons, the synapses, where tiny synaptic vesicles cluster together, poised to fuse with the axon’s membrane and release neurotransmitters to relay signals to other neurons in the brain or to muscle cells. The researchers in the study, led by Dr. Kenneth Miller, used the model organism C. elegans, a tiny roundworm with a simple nervous system, to show that neurons have a special system to protect those synaptic vesicle clusters from getting torn apart by the neurons’s retrograde motor dynein. The new system, dubbed the “CSS system” by the authors, seems to act as part of dynein’s transmission system, determining whether dynein engages with cargos. In a previous study, the researchers used C. elegans to discover a “gatekeeper” protein called JIP3 that keeps some kinds of organelles out of axons, where they could disrupt the neuron’s ability to send signals. Other researchers have since shown that Zebrafish and mice use the same system, and the human brain also uses a JIP3 gene. C. elegans mutants lacking JIP3 accumulate massive levels of organelles in their axons because their dynein retrograde motor can’t properly engage with cargo without JIP3. To find out how JIP3 promotes dynein transportation of cargos, the research team randomly mutated C. elegans JIP3 mutants, looked for mutants that suppressed the organelle accumulation, and then mapped the mutations to specific genes to identify the affected proteins. To their surprise, they discovered that the mutations disrupted proteins that were previously known to only function in holding synaptic vesicle clusters together, but were not known to have general roles in regulating organelle transport. The researchers determined that all three suppressor proteins functioned as part of the same system, which they named the CSS system based on the first letter of each protein’s name. The authors showed that the CSS system normally inhibits retrograde transport mediated by the dynein motor protein. JIP3 appears to physically block the CSS system from gaining access to the motor-organelle connection on organelles, thus allowing retrograde transport to proceed unimpeded – essentially essentially keeping the motor’s transmission engaged with its cargo. However, JIP3 does not interact with synaptic vesicles, so the CSS system is free to inhibit the dynein motor at synapses, thus preventing the precious synaptic vesicle clusters from being torn apart by the dynein motor. Dr. Miller says that, in addition to providing a window into the inner workings of neurons, the new results may have implications for human health down the road. “Organelles were recently shown to be important for axon growth, so the neuron might inhibit JIP3 to allow those organelles to build up in axons during axon outgrowth”, he said. Miller also noted that a recent study found that 14 human neuronal disorders were found to be associated with mutations in the Dynein motor system. Miller’s research was supported by a grant from the National Institute of General Medical Sciences, which is part of the National Institute of Health.